For the last week or so, Sen. Scott Brown has been taunting Elizabeth Warren about her Native American heritage. He says there's no way she could be part Cherokee, because her skin lacks the melanin that marks the swarthy hoards as being less worthy of Jesus' love than God's chosen Americans. By assailing Warren in this way, Sen. Brown is attacking Mitt Romney's most deeply held religious beliefs about Native Americans, or "Lamanites" as Mitt calls them. 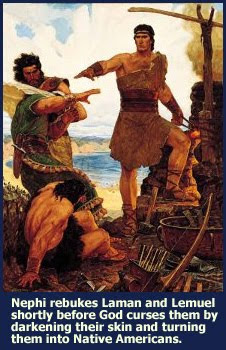 According to the late Mormon prophet, seer and revelator, Spencer W. Kimball, God is lifting His melanin curse from righteous Lamanites thus making them as "white and delightsome" as a bonafide Osmond. I am sure. The day of the Lamanites is nigh. For years they have been growing delightsome, and they are now becoming white and delightsome, as they were promised. In this picture of the twenty Lamanite missionaries, fifteen of the twenty were as light as Anglos; five were darker but equally delightsome. The children in the home placement program in Utah are often lighter than their brothers and sisters in the hogans on the reservation. At one meeting a father and mother and their sixteen-year-old daughter were present, the little member girl—sixteen —sitting between the dark father and mother, and it was evident she was several shades lighter than her parents — on the same reservation, in the same hogan, subject to the same sun and wind and weather. 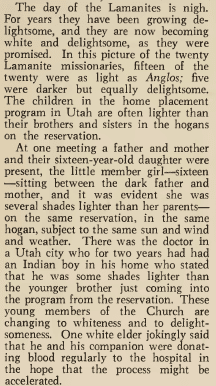 There was the doctor in a Utah city who for two years had had an Indian boy in his home who stated that he was some shades lighter than the younger brother just coming into the program from the reservation. These young members of the Church are changing to whiteness and to delightsomeness. One white elder jokingly said that he and his companion were donating blood regularly to the hospital in the hope that the process might be accelerated.